On April 13 and 14, the Longmont Symphony Chamber Orchestra will take the stage of Stewart Auditorium at the Longmont Museum. 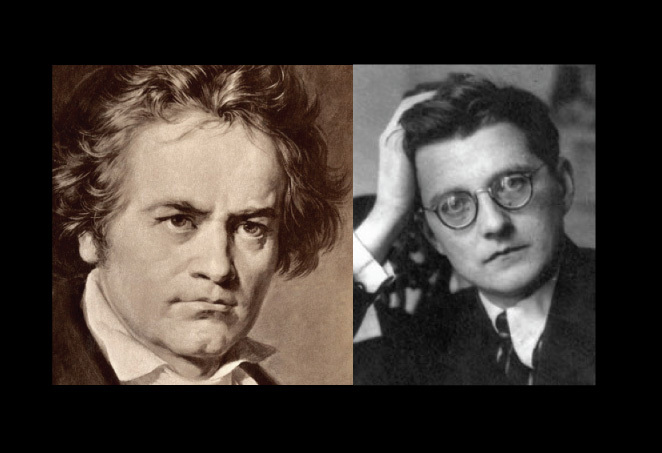 The program is the next step in our complete Beethoven Symphony Cycle, featuring his Second Symphony paired with his Egmont Overture and the Shostakovich/Barshai Chamber Symphony, Op. 110a. For several years, I have felt that the juxtaposition of Beethoven and Shostakovich makes for a very satisfying musical evening. Both composers — in entirely different ways — used their unique musical voice to respond to the historical context of the worlds in which they lived, used their music to shock and disturb, and used music to make their audiences think more in-depth about how we are all connected. Our program opens with Beethoven’s Egmont Overture. Completed in 1810, during the Napoleonic Wars, the music expresses Beethoven’s political concerns — particularly about Napoleon’s decision to crown himself Emperor. Egmont’s protagonist, Count of Egmont, had been condemned to death for taking a stand against an oppressive regime. By composing music that had political overtones and took a stand against oppression, Beethoven was setting an example for future composers of what music could be – not just harmonious sounds, but art that makes a political statement. This work became so popular and its meaning so universal that it became the unofficial anthem for the 1956 Hungarian revolution. In 1936, Russian composer, Dmitri Shostakovich, was denounced by Stalin and lived in constant fear for his own life and the lives of his friends and family. To continue writing music, Shostakovich penned a public apology of sorts to the government. One of the significant challenges that faces all listeners of Shostakovich’s music is that it can be hard to decipher the meaning of his music composed after 1936. From this time onwards, in order to protect himself and his family, he needed to write music that had two different sets of meanings — one meaning for the authorities, and a different sense for the people. 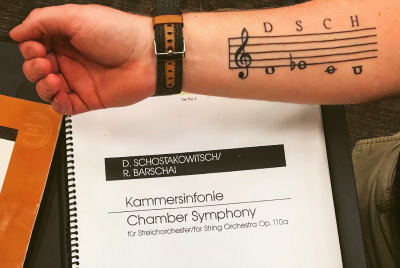 One enthusiastic Longmont Symphony musician showed up with body art featuring Shostakovich’s anagram (DSCH) for the first rehearsal of the Chamber Symphony Op. 110a. Shostakovich resorts for the first time to quoting themes from his earlier works, including his Symphonies No’s. 1, 5, 10 and 11, the opera that got him in trouble with the authorities in the first place, ‘Lady Macbeth of Mzensk,’ and his Piano Trio, which quotes a Jewish song meant to express his solidarity with this religious group who had experienced such unspeakable horrors during the Second World War. In each movement is the theme which is based on the notes D, Es (E-flat in the German notation, here standing for the letter “S”), C and H (B-natural in the German notation), which forms the anagram of his name Dmitri Shostakovich. This work, unlike virtually all of his other works composed since 1936 does not have ambiguous double meanings filled with codes — this piece is for the victims of Fascism and war, i.e., this piece is for Shostakovich himself. Our program concludes with Beethoven’s Second Symphony, which is our next stop on our complete Beethoven Symphony Cycle. His Second Symphony is one of the lesser performed of his nine symphonies. This work was written at a time when he was quite crippled with depression as he knew that before long, his hearing would be gone. Beethoven would not only go on to finish his Second Symphony in a hybrid Classical style, but go on to expand the orchestra, usher in the Romantic Period, and eventually find the need to add voices to the symphony when he expresses his “Ode to Joy” in his final symphonic movement.